From YEA.org: The Crossmen flourished last weekend during their fourth camp of the 2007 season in San Antonio. Eager to learn, grow and bond, the brass and percussion sections met at Ronald Reagan High School, the corps now having been taught more than five minutes of music for their break-out program "Metamorphosis." The corps also took on the mechanics of marching technique during an in-depth session with Marc Sylvester, the corps' visual coordinator and a DCI Hall of Fame member. 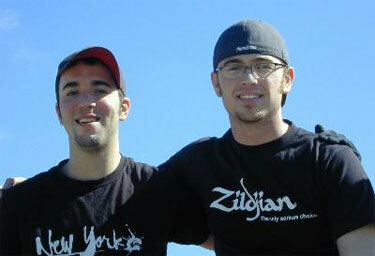 The 2007 Crossmen drum majors are Garrett Dillon and Jarrett Lipman. Crossmen veteran and baritone player Garrett Dillon of Virginia Beach, Va., was announced as the new drum major for the corps. The business management/marketing major at Old Dominion University in Virginia Beach, Va., will stand alongside returning drum major Jarrett Lipman in guiding the Crossmen on their 2007 adventure. Read more about the Crossmen's February rehearsal camp, the corps' 2007 leadership team and the corps' 2007 program "Metamorphosis" on www.yea.org.